City leaders are in the midst of bringing some longtime ordinances regarding parking violations and nuisance citations into the 21st century. Jered Reid, city attorney, and Community Resource Officer James Young presented some proposed upgrades to several ordinances last week that are intended to not only fix outdated language but add protections for both citizens and city officials. Reid first talked about the parking ordinance, which he noted was passed in 1991 and is difficult and problematic to enforce. He noted that the current law calls for parking citation recipients to handle the matter at the "municipal court," which no longer exists. Young noted that because of this outdated language, he typically rolls parking violations into the nuisance portion of the code. However, he said he would prefer to make use of the parking portion of the code. To remedy the problem, Reid recommended substituting the term with "citing officer or city official." The other problem Reid discussed was the fact that people have no way to contest a citation if they happen to not agree with the penalty. "Right now, there is no mechanism in the code to contest a parking citation. I find that to be very problematic," he said. "Anytime a government entity is punishing anybody, it is critical that they receive notice and they also receive a chance for due process." His solution is to enable people to go to city hall if they want to contest the citation. 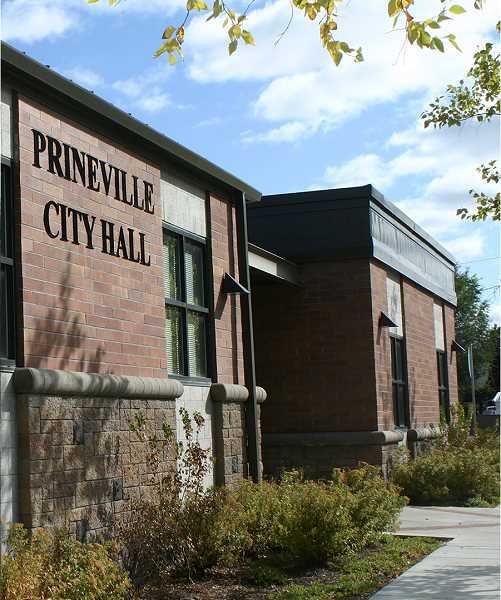 They would then receive a hearing in front of the Prineville City Council, which Reid points out serves a judicial role. To reinforce that fact, City Manager Steve Forrester pointed out that the council is already expected to adjudicate any planning commission appeals. "This is a protection we are giving citizens that doesn't currently exist," Reid said. Reid and Young then moved on to the nuisance code, which was passed in 1987 and primarily addresses problems on a person's property that upset neighbors. Nuisances can include anything from noxious weed issues or vehicle storage on local streets to excessive junk and garbage on the property. Currently, the law enables city police to serve offenders an abatement notice, which gives the property owner 10 days to take care of whatever nuisance applies. If they don't comply, according to the language in the existing law, the police can abate the problem — in other words they can go remove the noxious weeds or remove the junk or garbage on the property. The other option the city has is to fine the property owner. Reid noted that both options can create problems for city officials. He points out that financial penalties are not very effective when a person suffers from poor socioeconomic conditions that make it difficult to pay the fine or fix the problem. "It doesn't get to the root of the problem," he said. Furthermore, the option to abate the nuisance, or take the offending items from the property, could create issues with constitutional search and seizure laws. What one person considers junk, another might consider a valuable possession, Reid noted. "So what we have done is with a nuisance that involves private property, we have added a warrant requirement for our police or city official," he said. By going to a judicial officer to obtain a warrant, a neutral body gets involved that could find probable cause to seize the property in question. Also, the person who receives an abatement notice will be given a chance to challenge the requirement. Reid noted that the inclusion of a warrant requirement and the opportunity to challenge the abatement mandate offers protections for the citizens as well as city officials. The civil penalty portion of the nuisance code will remain and will act as an enforcement tool when needed and prevent people from ignoring abatement notices. City Councilor Teresa Rodriguez expressed concerns that people might disregard the abatement notice, let the 10 days pass and let the city clean up their mess and pay whatever the city charges to do the work. In other words, she doesn't want citizens to pay the city to clean up their property. The city charges $50 or 15 percent of the cost of the abatement, whichever is higher, as well as any overhead costs incurred to complete the project. While that is the case, the civil penalty can also be applied. The fine for a first-time offense is $50 to $250. A second offense within two years will increase the fine thresholds to $100 to $1,000. "Every time they do that, this cost is going to be incurred and put onto their property," Reid said. "Eventually, that lien is going to get to a level where they are subject to foreclosure." For those who are facing financial or medical hardships that make them unable able to clean up their property or afford the costs associated with city abatement, local officials are willing to step in and help without threat of penalty. Young noted that he has already run into such situations and has leaned on different resources and groups throughout the community to conduct neighborhood cleanups or employ other methods of dealing with nuisances. He and Prineville Police Chief Dale Cummins went on to stress that the goal is not to collect fines but to gain compliance with nuisance laws. All of the proposed changes were approved for their first presentation by the city council and will be considered for a second time at the council's next regularly scheduled meeting on April 9.